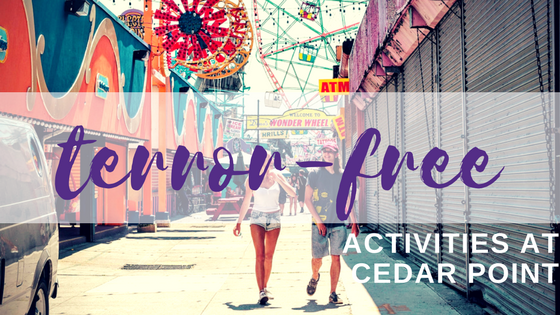 1) For the moderately risk-averse, Cedar Point offers rides that while nowhere near as scary as roller coasters, still provide thrills that will leave you feeling you have fulfilled your amusement park duty to ride. Classified appropriately as “thrill rides” these include Ocean Motion, Scrambler, and Thunder Canyon, to name a few. Keep in mind, however, this category also includes rides requiring considerable daring, such as the Slingshot, Windseeker, and Power Tower, options that may actually fall closer to the category of mildly risk-averse. 2) For the very risk-averse, the “family rides” category provides a range of options from the Giant Wheel where the entire park can be viewed from the comfort of a cabin, to the similar Sky Ride and the ever-popular Tilt-A-Wheel. For the younger (and older) set, the category also includes Kiddie Kingdom Carousel, Antique Cars, and the Cedar Point and Lake Erie Railroad, among others. For the most part, however, these rides are vertigo-free and remain close to terra firma. 3) If rides of any kind are off the table, Cedar Point offers an ongoing slate of world-class live shows that will please even the most critical in your group. For 2018, the lineup is still being planned but shows may include everything from dancers and acrobats to Broadway plays to concerts in a variety of genres including rock, pop, and country. 4) For those who love all things Jurassic Park, Cedar Point’s Dinosaurs Alive! exhibit is about as close as one can get to the real thing. This immersive experience includes more than 50 life-size, scientifically accurate animatronic dinosaurs from the Mesozoic period. These amazing giant replicas actually move, with several that can be controlled, if you dare. Designed for all age groups Dinosaurs Alive! also offers a unique interactive learning experience that will complete your journey through time to the land of the terrible T-Rex! 5) Cedar Point also offers a variety of hands-on experiential activities for all ages. On the Frontier Trail, The Candle Shop provides the chance to dip a candle of your own and the Fort Sandusky Mining Co. is a prospector’s dream-come-true where kids young and old can pan for real gemstones. Also very unique is The Glass Academy Glass Blowing Experience where real glass masters demonstrate how molten glass is formed into beautiful objects and offer hands-on opportunities as well. 6) Of course, there is also the option of spending your trip at Cedar Point Shores Waterpark, a place where you can relax and bask in the balmy breezes off Lake Erie or jump right in! Waterpark visitors can enjoy the waterslides of varying heights, take a lazy float down Cedar Creek, or let the water do all the work in the Breakwater Bay Wave Pool! Other water-soaked fun includes Runaway Rapids, Riptide Raceway, and Great Lakes Cove, each offering different ways to enjoy the long-awaited return of summer! No matter how much your group members love or hate amusement park rides, Cedar Point can accommodate! To get you there, Indian Trails has all the luxury and comfort available in a motorcoach and decades of experience traveling to Cedar Point with groups of all ages and sizes. Find out more about our charter services and request a quote today!